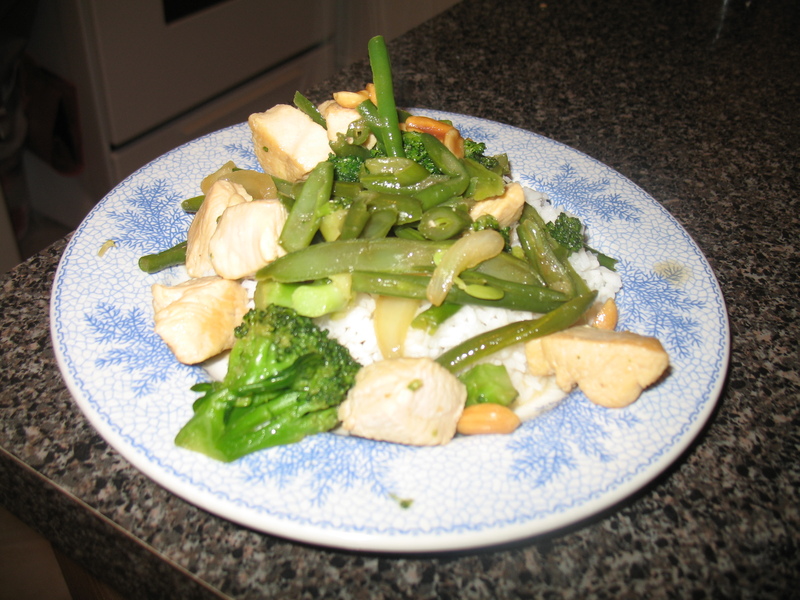 This dish is Asian because I added soy sauce | Food E.
Hello friends! This has been a particularly busy week for some reason, but a little birdie told me that a loyal reader really missed my posts (hi Ron!). This dish seems mundane to me, but if I can spark an idea in just one brain for an easy and delicious dinner that travels easily to work the next day for lunch, well… then I think it’s worth it. Heat oil over medium heat. Add chicken and brown on all sides. Add vegetables to the pan along with 2 Tbsp of water and cover. Cook for 10 minutes. Remove cover. Add brown sugar and garlic salt and stir. Cook for another 5 minutes. Add soy sauce and peanuts and toss until everything until coated. Serve over cooked white rice. *Note: I took a short cut (so SUE me) and bought a bag of “Oriental Vegetables” (hey Krasdale: it’s 2011, time to update) frozen and then threw them into the pan. It was easy as pie. You can surely add raw vegetables to this, though, and as many or as few as you like. This tasted delicious with broccoli, green beans, mushrooms, and onions.